[_?_] they meet thee at the pearly gate. The tombstones pictured above are found in Oak Hill Cemetery; Talbotton, Georgia. 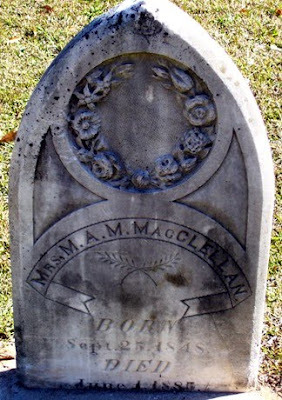 The first, Mrs. Molly A. Mathews MacClellan, was daughter of Josiah M. and Lavenia C. Mathews. 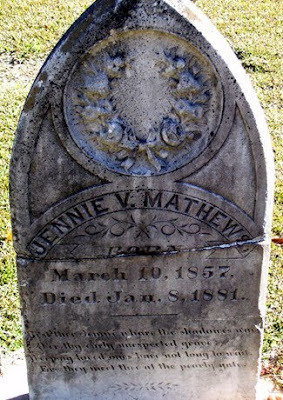 The second is Lavenia C., wife of Josiah M. Mathews. The third is Jennie V., another daughter of Josiah and Lavenia. An obituary for Jennie follows. At the residence of her parents, in Talbotton, on Saturday last Miss Jennie Mathews, after a protracted illness. She was a most accomplished young lady, and possessed rare virtues of heart and intellect. Her name will live as a sweet memory in the hearts of her many friends and acquaintances. The sympathies of the intire [sic] community are tendered the bereaved parents and relatives. 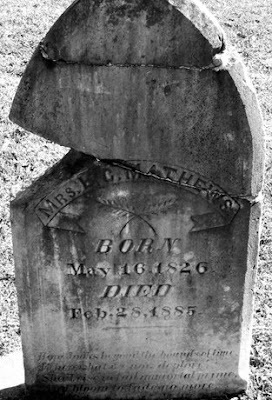 Her remains were enterred [sic] in Oak Hill Cemetery on Monday morning last Rev. E. H. McGehee, of the M. E. Church conducting the ceremonies. -- Talboton [sic] Register.